Please note that the content of this book primarily consists of articles available from Wikipedia or other free sources online. Jörg Drehmel (born 3 May 1945 in Trantow) was an East German athlete, who, competing for the GDR, won the silver medal in the triple jump in the 1972 Summer Olympics held in Munich, Germany. In addition, he also won the European Championship in the men's triple jump in 1971. 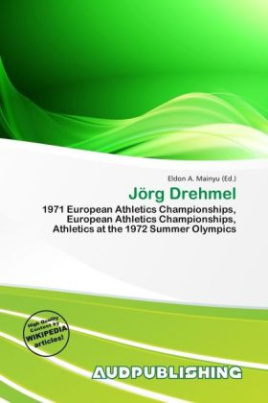 Drehmel first tried his hand at the javelin throw and the decathlon before switching to the triple jump in 1966. He competed for ASK Vorwärts Potsdam and trained under Heinz Rieger. His first big success came with a win at the European Cup in 1970, where he was the first German jumper to set a record with the first-ever jump over 17 meters. His jump of 17.16 meters to win the European Championship in 1971 did not qualify as a record due to excessive tail wind.